This is perfect for brunch or even main family dinners. The real plus is the spinach pie tastes even better as leftovers the next day. Sliced in thick squares, served hot or cold,it is a real treat and was my late Mother’s fav dish that I could prepare for her. 3 frozen packages of spinach or 3-4 bunches of fresh washed spinach. Preheat oven to 350 degrees. Heat a skillet with a few drops of edible gardens Basil or Rosemary grapeseed oil and add spinach. Cook until wilted. Add onions, chopped and cleaned, and fresh herbs if available. I love a bit of fresh Basil. In a mixing bowl add eggs, feta,spinach/onion mixture and stir. Select a big enough baking pan (13×9) and generously grease the bottom with eg grapeseed oil. Start your layers..one sheet phyllo..and a layer of egg mixture..then another layer of phyllo and another layer of egg mixture. 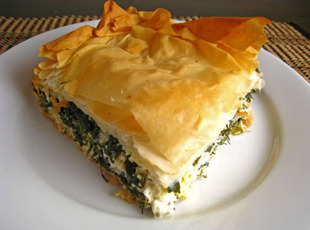 Top EACH layer of phyllo with a generous brush of eg grapeseed oil.Don’t forget the top final layer as well. This will allow each layer to rise and keep the top layer golden brown. Continue the layers..you should get four or five to the pan. Use a sharp knife and cut off the extra phyllo pastry hanging over the sides of the pan. Bake for 40-50 minutes. The pie will be golden brown on top, delicious all the way through!